Set into a wall near the harbour mouth is a slate plaque commemorating David Sinnett-Jones, who sailed solo around the world after losing an eye and a lung. He and his wife Gillian are shown in the photo (right) by Dr Hugh Herbert. He was born in 1930 to parents who were professional singers. He served in the Merchant Navy and in the army before becoming a theatrical electrician. His career as a motor racing driver lasted for over a decade until he lost the use of an eye in an accident in 1968. David became a dairy farmer in Llangeitho, Ceredigion. He sold the farm after being diagnosed with cancer in 1980. His treatment included the removal of a lung and part of the wall of his heart. Thinking he didn’t have long to live, he decided to visit his daughter in South Africa – not by flying there but by sailing in a boat which he designed and built himself! Cured of cancer, David circumnavigated the world on his own from 1985 to 1988 in another self-made yacht. 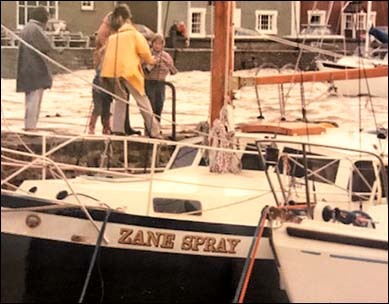 This one was named Zane Spray and is shown in the picture on the left (by Dr Hugh Herbert) with David facing the camera. It was based on a design by 19th-century yachtsman Joshua Slocum. It sank in 1997, and David built a new yacht, again based on a Slocum design. He used it to retrace (with an assistant crew member) Slocum’s voyage in the 1880s from Paranaguá, Brazil, to Washington DC, USA – a distance of almost 9,000km (5,500 miles). 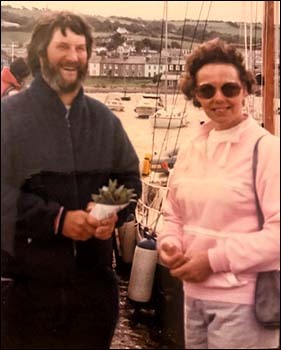 In 1990, David and his friend Peter Lloyd Harvey circumnavigated Wales! Starting and ending at Aberaeron, they used canals to travel from the Dee to the Severn. David wrote three autobiographical books. He died, aged 74, at his Aberaeron home.